Stars live for a long time, with even the most massive stars having lifetimes measured in millions of years. But, for a mere few thousand years towards the end of their lives, some massive stars go through what astronomers call the yellow supergiant phase. This is remarkably short in astronomical terms, and, as a result, stars in this phase are incredibly rare. In a recent study, astronomers from Lowell Observatory have acted as “stellar paparazzi”, managing to identify hundreds of these rare yellow supergiants, and their more long-lived descendants, the red supergiants in two neighboring galaxies. The Lowell astronomers use these newly identified populations to provide a stringent observational test for the theoretical models which describe how these stars change from blue, to yellow and then to red. These constraints are vital because the behavior of the models in this phase can influence many theoretical predictions, including something as “basic” as what types of stars explode as supernova. Nearby red supergiant stars include such well-known stars as Betelgeuse, Antares, and Mu Cephei, and yellow supergiant stars include names like Canopus and rho Cassiopeiae, although these stars were not included in the study. As described in two recent papers the group from Lowell Observatory, using NOAO facilities in Chile and the Multiple Mirror Telescope in Arizona, have observed a relatively complete set of the red and yellow supergiants in the nearby galaxies of the Large Magellanic Cloud (LMC) and M33. 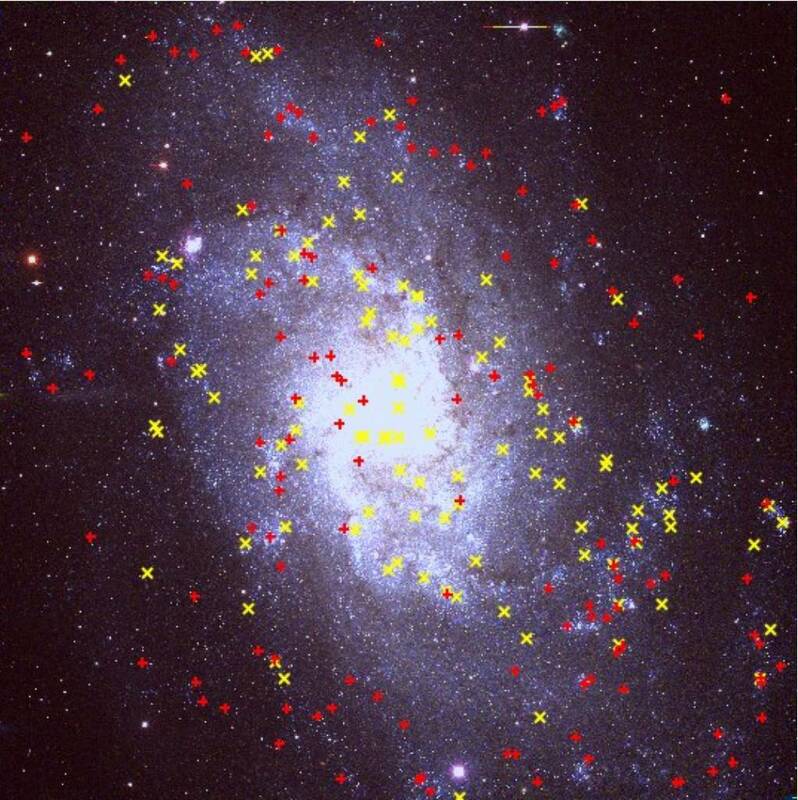 The location of the supergiants in the LMC are shown in Figure 1; those in M33 are shown in fig. 2. The astronomers compared their observations with computer models of stars derived by a group at Geneva Observatory, Switzerland, and find excellent agreement between their observed sample and theory in predicting the stellar lifetimes and general stellar properties during a critical period near the end of the stars’ lifetimes. This is in contrast to studies from three years ago by the same teams that showed large discrepancies between yellow supergiant populations and a previous version of the Geneva evolutionary models. These two studies were led by two young researchers at Lowell Observatory, Kathryn Neugent (lead for the LMC study) and Maria Drout (lead for the M33 study), and both involve an international collaboration with Dr. Georges Meynet (Geneva Observatory), one of the world’s experts in stellar evolution theory. Both women retain the status of researcher at Lowell, while pursuing other concerns: Ms Neugent has recently joined the staff of MITRE in Colorado Springs as a cyber security analysist, and Ms Drout is completing her first year in the PhD program at Harvard. Phil Massey, a staff astronomer at Lowell Observatory, helped with both studies, and Brian Skiff, another researcher at Lowell Observatory, helped with the LMC study. Fig 2: The yellow and red supergiants in M33. Image taken as part of the NOAO Local Group Galaxies Survey (P. Massey). To astronomers, the HR diagram (a plot of the intrinsic luminosity versus temperature of all stars) is key to understanding the evolution, or lifetime, of stars. For most of their lives, stars, fueled by hydrogen in their cores, are constant in brightness and temperature, and this phase, termed the main sequence, is well understood. But there have been problems with understanding how the temperature and luminosity of a star rapidly changes as the core of the star is exhausted at the end of the stellar life. Understanding the late stages of stellar evolution is important for other questions, too. Yellow supergiants may be the progenitors of core-collapse supernovae, and understanding supernovae completely has important implications for cosmology. Interpreting the HR diagram depends on mathematical models of a star’s interior, which indicate how stars of different masses change with age. These models, based on knowledge of the physics of nuclear reaction rates, predict how a star of a given mass will change in temperature and luminosity over its lifetime, but models require careful comparison with actual observations. Suppose curious aliens visited earth and, from a quick schoolyard survey, noted that human weight and height increase with age. The aliens might propose a model for human growth in which weight and height increase smoothly with age, but this model would not allow for adolescent growth spurts or middle age. If they compared their model with further measurements of fast sprouting teenagers, they would be puzzled. This is akin to the problem astronomers have faced in understanding the red and yellow supergiants. Previous evolutional models predicted far too many yellow supergiants—in other words, theoretical yellow supergiants seem to live much longer than the real stars in nature. This may resonate with those familiar with star names: it’s easy to come up with examples of red supergiants like Betelgeuse, but more difficult to think of examples of yellow supergiants whose lifetimes are measured in only a few tens of thousand years. The Lowell group studied the supergiants in nearby galaxies, rather than our own Milky Way, to avoid the problems of identifying and characterizing stars at different distances. First, they selected stars based on their colors and angular motion across the sky. For the LMC study, they obtained spectra of almost 2,000 stars by making use of Hydra, a spectrograph on the Blanco 4-m telescope on Cerro Tololo (in northern Chile) that allows many stars to be observed at the same time. They obtained a similar number of spectra of the M33 stars using Hectospec on the 6.5-meter MMT telescope located on Mt Hopkins (in southern Arizona). The spectra provide a star’s radial velocity: motion towards or away from us. This is key to deciding which stars are actually foreground red and yellow stars in our own Milky Way galaxy, masquerading as red supergiants in these other galaxies. The work by the Lowell astronomers was supported by the National Science Foundation.